Chad and Wess Make a Podcast: Wess Reads Comics - Free Comic Book Day 2017 Edition! Wess Reads Comics - Free Comic Book Day 2017 Edition! In this, special edition of Wess Reads Comics, Wess shares his haul from Free Comic Book Day 2017! That was pretty much my reaction when getting to the end of Free Comic Book Day's 'Secret Empire'. 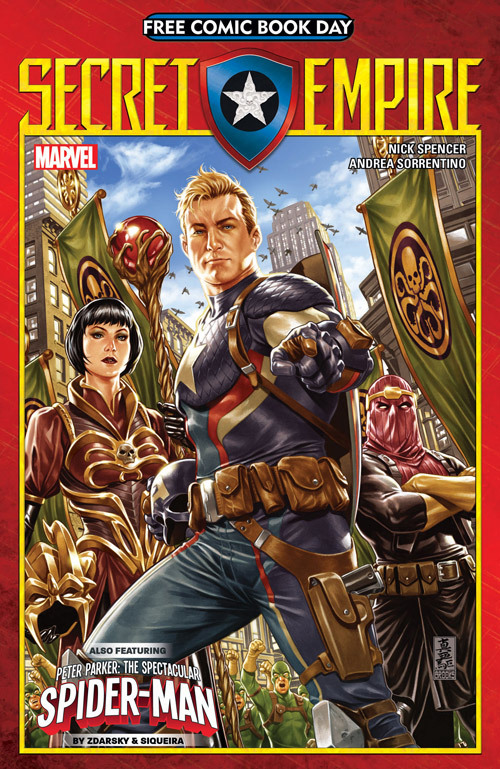 The story takes place, presumedly, between Secret Empire #0 and Secret Empire #1. Steve Rogers, finally, steps out of the shadows as a HYDRA operative leader in order to reveal himself to the world; including many former teammates of his. This assault on the heroes ends with Cap and HYDRA somehow taking control over Vision (with technology) and Scarlet Witch (with magic). Oh yeah...and Cap picks up Mjolnir. This should open up a new can of worms debate over what the inscription on the side of the hammer means. Do you, in fact, have to be worthy, or do you just have to believe 100% that you're worthy? If it's the former, then what in the hell is Steve Rogers worthy of now?!? !